Well, here we are, clean sheet of paper, workbench cleared ready for action, so what to build next? The Pizza is now over 5 years old and trains have probably made thousands of circumnavigations. Time for a change, methinks. The original plan was to build a model of Schull, on the Schull and Skibereen line in Ireland. I still intend build this station as the baseboards are in fact ready but in the meantime I've become interested in the idea of building small working dioramas, being influenced by the type of work being done in Europe by members and associates of Gemme and shown at Expometrique in the various annual Defi Gemme "challenges". This style of layout is small, simple and often has some form of working scenic feature to add interest. My own ideas on this subject have crystallised in the design shown in the sketch here. It's a simple layout with a single line and one siding. From the left, the line runs over an ungated level crossing, into a simple rudimentary halt (to provide an excuse for passenger trains), past the siding, a small water tower and over a trestle bridge spanning a small creek. The siding will have some form of working feature as I envisage it as a mineral loading facility. It will be equipped with an electomagnet to operate my chosen design of autocouplers. Overall the length of this scenic section is 600mm and either end of the layout will feature a 200mm section of "fiddle yard" from where trains will arrive and depart, giving an overall length of 1000mm (1 metre). Width is 250mm, giving sufficient space for scenic development.. The layout is built to metric dimensions as a nod towards its Gallic influences. However, in practice, a metre was just a bit to short, so I added an extra inch to either end. The whole scene has integral back and end boards, making it a sort of "model theatre" where the trains are the actors. One of the advantages of building a small scene like this is that it can be given a high level of scenic development, to a stage that would be daunting and probably not feasible on a larger edifice. An important point to remember is that the overall scene needs balance, which here is achieved by having the road and creek at either end of the layout. Careful placing of trees, buildings and other features will enhance the overall picture. The railway enters the scene through simple holes cut into the end boards. These will be camouflaged by trees and bushes, rather than somewhat contrived bridges or tunnels. My view is that narrow gauge layouts need to be kept simple to reflect the character of this type of railway. 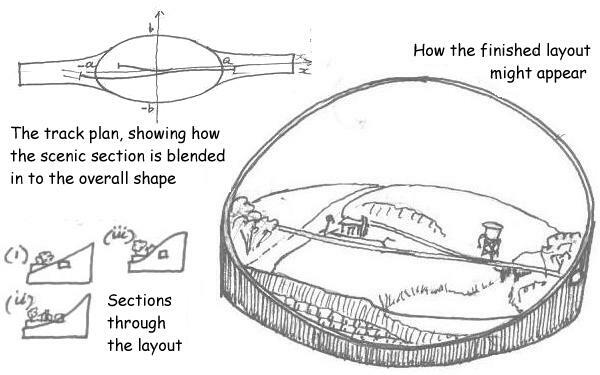 In the course of some e-mail discussions with a 2mm colleague, David Eveleigh, he suggested the idea of making the scenic area elliptical in shape. This is a very intriguing idea and the sketches David sent me are reproduced here to give some idea of how such a design might appear. Unfortunately, the baseboards for the layout are pretty well finalised, so this concept will be put on the back-burner for a future project. What David's sketches do illustrate is the attractive visual appearance gained by moving away from the traditional rectangular model railway designs. So, having defined the concept, on with the construction.